Bio-identical hormones are exactly the same hormones that a woman’s body produces. They are also called “natural” hormones, because although they are synthesized in the laboratory they come from plant sources, making them similar to human hormones. Being natural and identical they produce the same effects and follow the same metabolic pathways as the original hormones generated by the body itself. Hormonal balancing is achieved and it means significant improvements in the quality of life. What are subdermal implants or pellets? They are implants that are placed under the skin with local anesthesia. In this case, they are placed under the buttocks so they are not visible. SottoPelle® system allows customization hormones according to the personal tone and the needs of each patient by analytical studies. So the pellet or implant is customized for each patient. Once these small implants are placed under the skin, constantly release small physiological doses of hormones when the body needs, providing an optimal therapy. 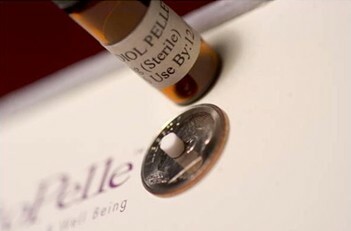 SottoPelle® are bio-identical or natural hormones that are placed under the skin as a subdermal implant or pellet. Combining the use of bioidentical hormone pellets of high quality, with the exact dose and the appropriate method of inserting the pellet provide the safety and effectiveness of SottoPelle® therapy. The success of this treatment depends on the experience accumulated since the pellets used have been applied for in the same way by a prestigious pharmaceutical company for over 45 years. The materials selection process and the precision with which are produced, result in high quality pellets; pellets that can fulfill its function perfectly, week after week and month after month. This ensures that each patient receives personalized and complete the necessary and appropriate hormone doses between 4 and 6 months. Study after study has confirmed that the use of estrogen and testosterone bio-identical hormone replacement therapy by pellets has had a positive impact on diseases such as osteoporosis, prostate cancer and HIV. Hormones can be presented individually or merge into very small solid cylinders called “pellets”. The pellets are slightly larger than a grain of rice: about 3 millimeters in diameter. Each pellet contains pure human hormones in a 99.89% and fatty acid 0.2% which serves to unite them. Unlike other pellets SottoPelle® do not use synthetic filler. With hormone replacement therapy SottoPelle® can strike the right balance of estrogen and testosterone, which your body needs to maintain optimal health. Therapy recovers gaps in the aging process using identical hormones that the body needs, resulting in good health. With the decline in hormone production by the ovaries during menopause, the body has shortcomings. With Hormone Replacement Therapy SottoPelle® these hormones are achieved as it is able to act when the ovaries has decreased their activity. The pellets work together to provide the body what it needs. Any increase in heartbeat causes blood to flow faster into the pellets, releasing the required amount of hormones into the bloodstream.